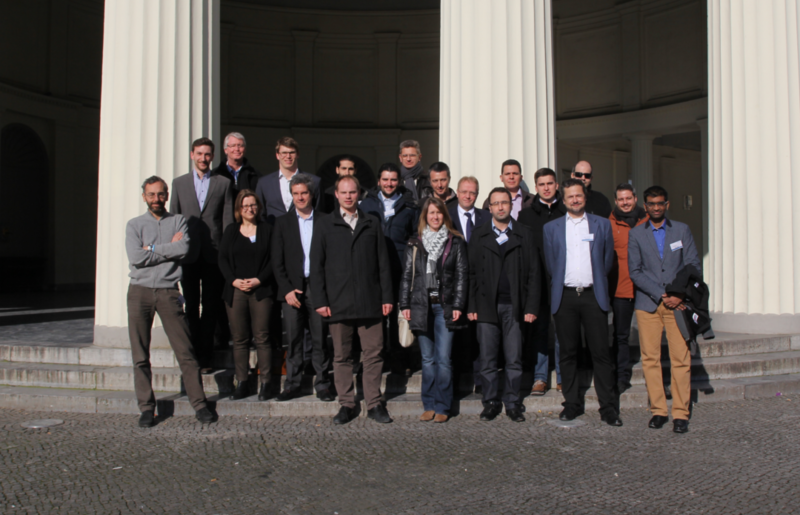 The Robots to Re-Construction (Bots2ReC) project started in February 2016 as an H2020 Innovation Action. This project has received funding from the European Union's Horizon 2020 research and innovation programme under grant agreement No. 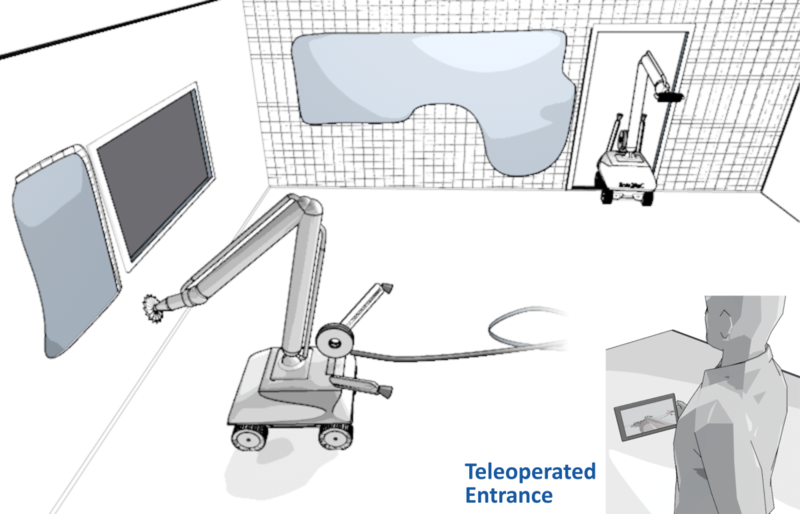 687593.
of asbestos contamination at a real world rehabilitation site using a robotic system." 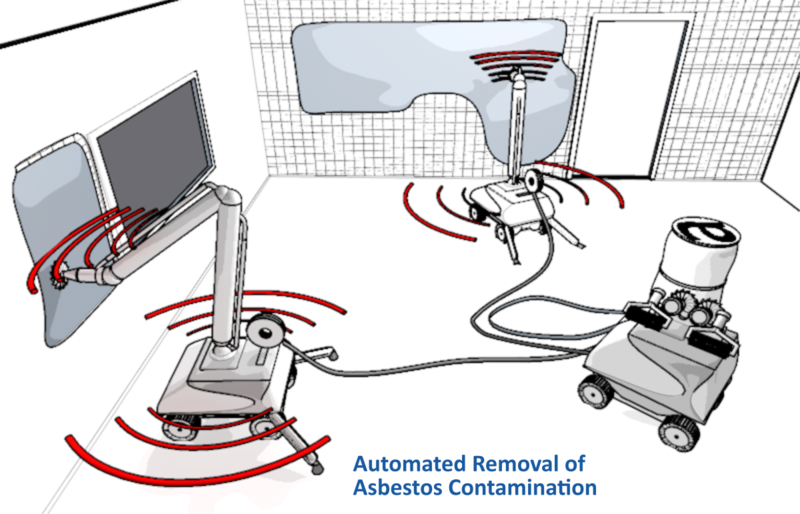 The proposed robotic system used for the automated removal of asbestos contamination will consist of multiple mobile robotic units that perform the asbestos-removal-tasks autonomously. Each unit consists of a mobile platform and robotic arm with an abrasive tool. The combination of optical and radar sensor systems will allow the environmental perception and local monitoring of the asbestos-removal-tasks. 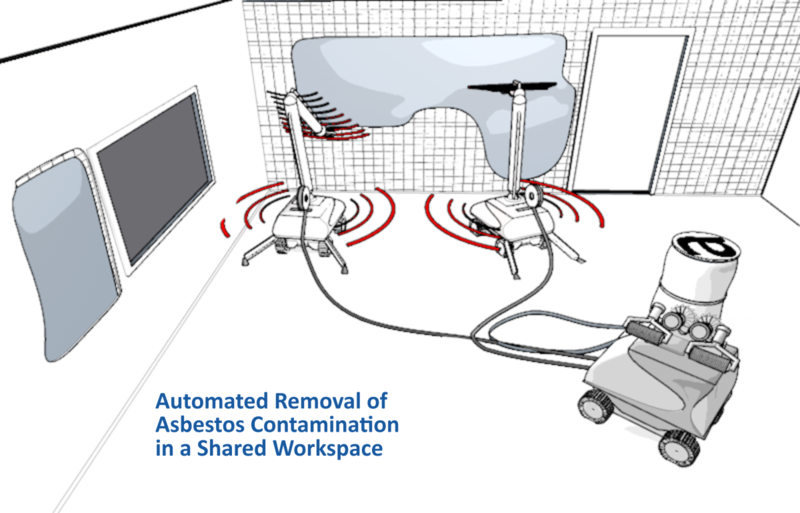 Supported by a user interface, the operator can select different areas on a virtual representation of the rehabilitation site and assign asbestos-removal-tasks. 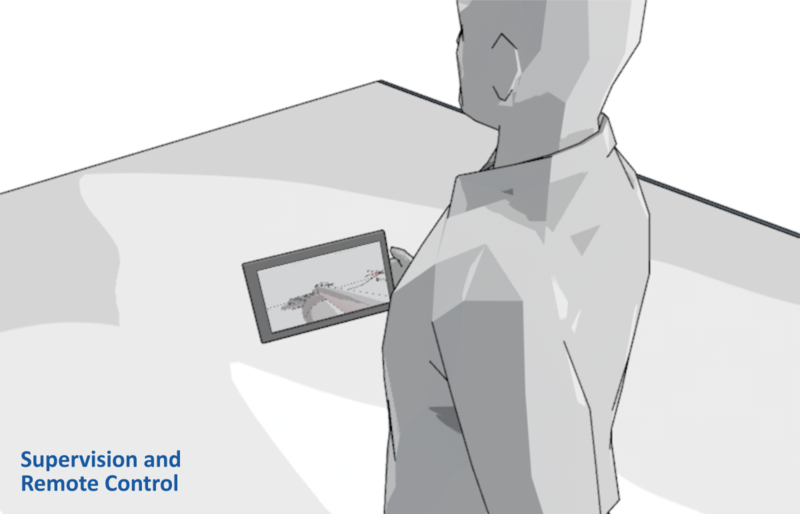 Based on the user input, the central process control system plans the task allocation and collaboration between the mobile units and their movements and trajectories autonomously. The user interface allows the permanent supervision of the automated process and optional remote control. 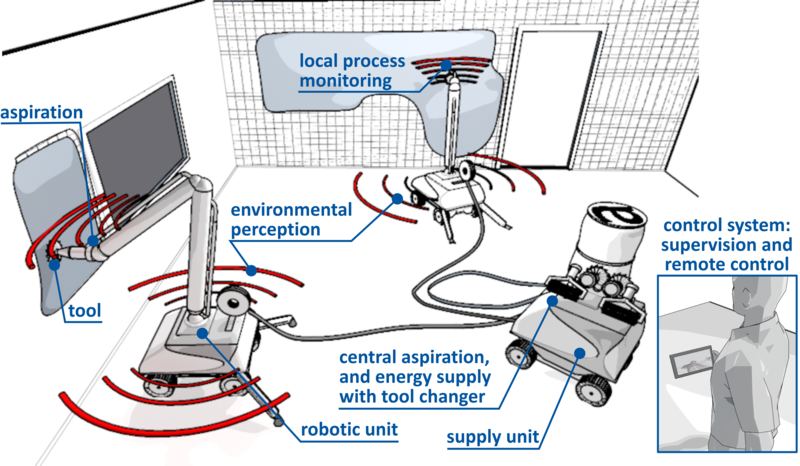 All robotic units are connected to a central aspiration and energy supply to remove the waste from the rehabilitation site and supply sufficient energy for the robotic units. During operation the presence of the operator and workers at the contaminated space will be avoided as much as possible and be limited to unforeseen difficulties. However, the maximum allowed level of dust at the site ensured by the aspiration system will allow direct intervention by the operator at the end of the process or for unforeseen difficulties (breakdown for example). Maintaining the maximum allowed dust level in the quoted valuable range is assured by aspiration of dust right near the tools and state of the art centralized ventilation and filtering system for the site. The robotic units and tools will be sealed and covered with removable gaskets, where sealing is not feasible. At the end of the operational process, they are cleaned and decontaminated manually by spraying them with low pressure water. Asbestos (a naturally occurring mineral forming thin fibrous crystals) was widely used for construction materials, due to its beneficial physical properties and low price. Today, asbestos dust is known to be hazardous for humans and for this reason millions of flats and buildings have to be refurbished to remove the hazardous asbestos. A task which is putting humans at danger and is very inefficient without robotic solutions. Our technological approach is to use semi-autonomous mobile robotic units that remove the asbestos material in a secluded and empty flat. 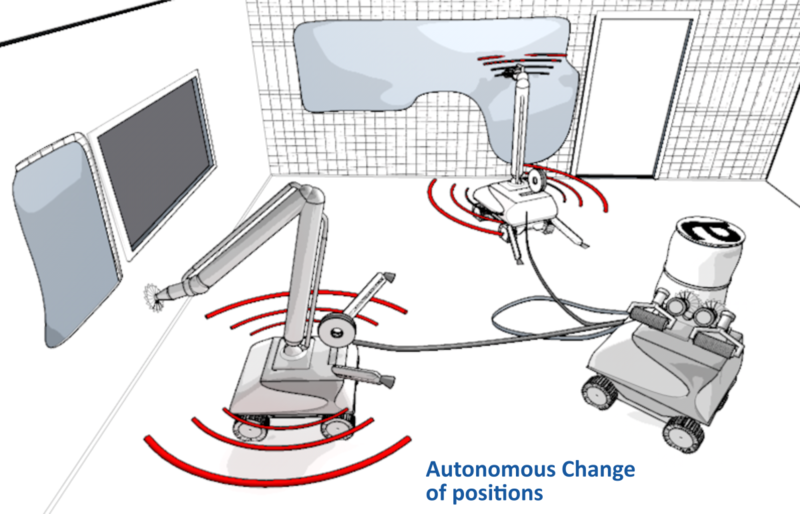 The first version prototype was developed in several iterations, with the main challenges being the workspace considerations for the robotic arm and the integration of the aspiration system, the cable reel and all controllers and electronic boards in a very limited footprint given by the indoor use of the robot. The robots are controlled via a Central Process Control System for the task planning and feedback to the user. The Interface gives a live visualization and access to the camera pictures and allows for the setting and control of the process parameters during operation. 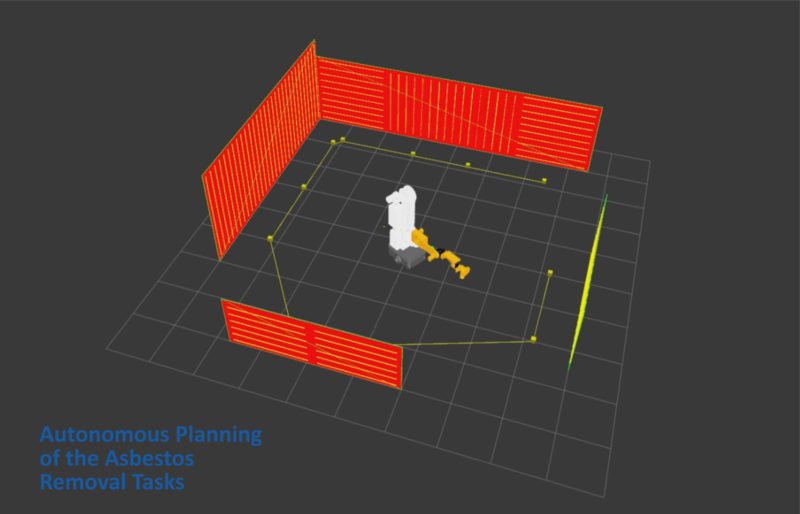 To enable autonomous task planning, a lightweight semantic map of the robot’s environment is being developed to capture the removal site geometrically, augmented by information relevant for asbestos removal. 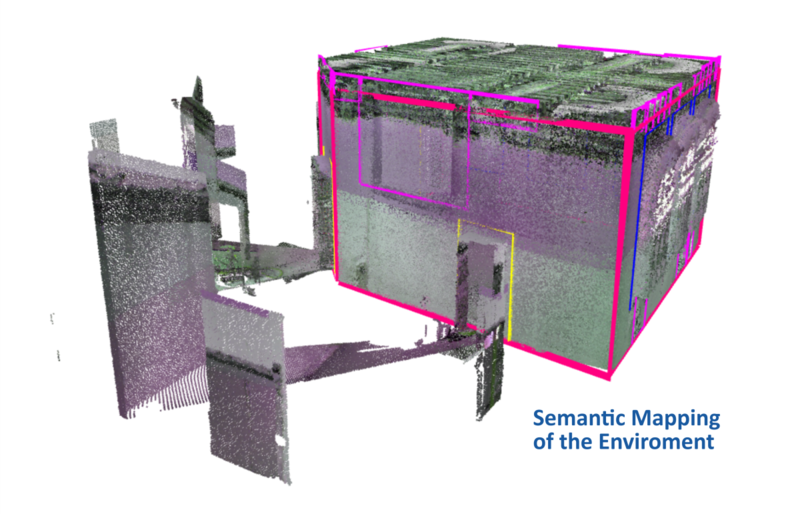 Our approach is an autonomous exploration of the refurbishment site to record the raw data, which is then analyzed to classify all components in the room and generate a semantic map to be used for the planning and for visualization in the user interface. The prototype and the overall process are tested on our testing site in Bourg Le Valence in France. With the mock-up of a rehabilitation site and a control room for the operator, we are able to test the functionality and teleoperation of the first prototype in a realistic environment, without exposing anyone to danger. - Get updates on the technological developments and achievements within the project. - Participate in the development of the system architecture and the soft- and hardware. - Participate in the development of approaches to address user- and regulatory issues. - Review and discuss the scientific and technical information from the project network. - Advising the project network on broad scientific matters in science, technology, social, economic and ethical issues. After registration you will receive regular updates and the project newsletter on the recent developments in the Bots2Rec project and you will be invited to join the annual meetings of the Advisory Board for an extensive exchange and live demonstrations of the robotic system. The Bots2ReC consortium consists of seven partner institutions with extensive expertise both in research and development on the one hand and in product placement and operation of robotic systems on the other hand. Of major importance for the contribution to the project's objectives the representation of all relevant stakeholders of the value chain in the clearance and refurbishment sector. The use case is driven by the industrial Partner Bouygues Construction, covering the whole value chain in the construction sector by designing, building and operating public and private buildings. Its subsidiary Bouygues Batiment Nord-Est construction has detailed knowledge on every aspect of clearance and refurbishment projects. With this partner the end user needs (owner of a building to be renovated) and the requirements of a service provider (Bouygues Construction and Bouygues Batiment Nord-Est) are fully represented in the consortium. With its market domain in construction and demolition industry and extensive research expertise in automation, the enterprise will play a significant role in maximizing the project's innovative potential. 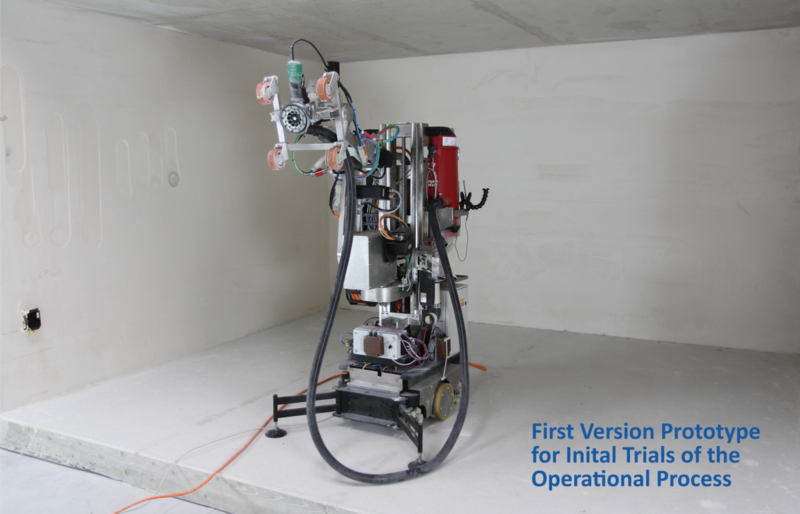 Bouygues Construction ensures realistic testing conditions during all stages of the project and provide real world testing facilities, which are essential for the final implementation and benchmarking of the operational process and robotic system. Besides Bouygues Construction, Telerobot Labs S.r.l. supports extensive market outreach and contribute decisively to the commercialization and generalization of the project results. The work package sections to conduct the realization, distribution and usage of the robotic system will be significantly affected by the expertise of the partners from industry. Robotnik Automation SLL and Telerobot Labs S.r.l. contribute their knowledge and expertise regarding design, integration, control and navigation of mobile platforms and robotic arms, especially for harsh environments. 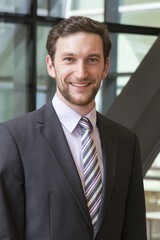 indurad GmbH contribute their knowledge and expertise regarding optical and radar sensor technology. The Fundacio Eurecat contributes to the process control system and ensures the smooth system integration on hardware and software level, thanks to their wide expertise in these fields. The enhancement of the state of the art technology and the system evaluation is supported by the research partners RWTH Aachen University (Coordinator) and Institut Francais De Mécanique Avancée. 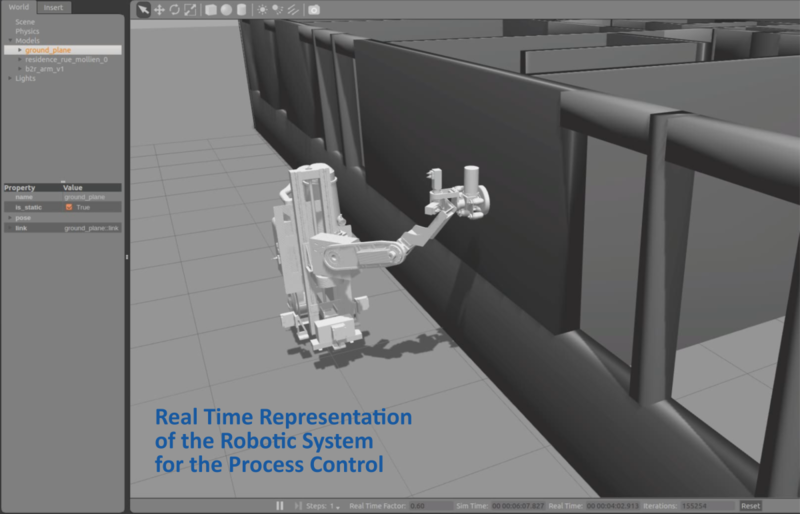 The project relevant expertise of the RWTH Aachen University lies within in the scope of control and evaluation of robots, advanced task planning algorithms for modular and reconfigurable handling systems and systematic design processes. With the Institut Francais De Mécanique an expert in perception, computer vision, system behaviour analysis, simulation and multi robot collaborations will significantly contribute to the enhancement of the current state of the art.